Like every Sunday morning, a Zapotec grandfather goes to the city of Oaxaca to visit his granddaughter for the day. Their ritual consists of attending mass and window-shopping throughout the city. On this particular Sunday, their routine is disrupted when they pass by a stand selling watches. El Reloj shows a day in the life of a Zapotec grandfather and his granddaughter. 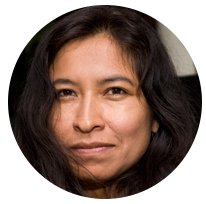 Yolanda Cruz is a filmmaker from Oaxaca, Mexico whose work has screened at festivals worldwide. She is a 2011 Sundance Screenwriting and Directing Lab Fellow with her first feature script La Raya, to be produced by Canana Films in 2014. El Reloj, Yolanda’s second fiction short film, launched by Petate Productions and Latino Public Broadcasting, premiered at the Morelia International Film Festival in 2013. Currently, Cruz is developing “Migrant Heroes”, an online series of mini-documentaries about migrant heroes in the U.S., set to go live in 2015. Cruz holds an MFA from the UCLA School of Theater, Film and Television.